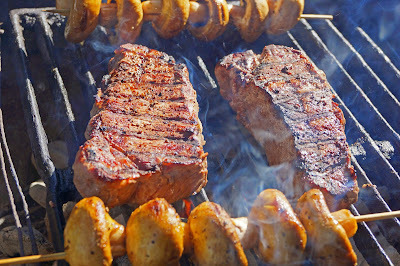 Two New York steaks, one prime, one choice will do battle on the grill for a taste comparison cook-off. Will one prevail in the tenderness or taste in this non-scientific culinary experiment? Pull up some barbeque tongs and let’s fire up the grill. 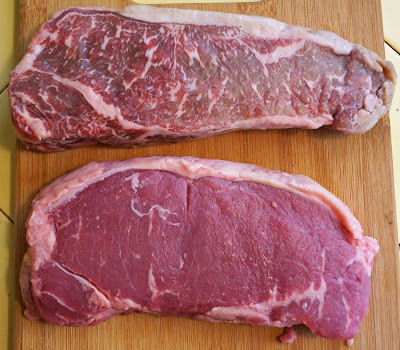 Both of our New York steaks are from Harris ranch. The Choice was procured directly from Harris Ranch in Coalinga, California. It has been wet aged for at least three weeks. The Prime cut was purchased from Alexander’s Prime Meats in San Gabriel California. They purchase prime beef carcasses from Harris Ranch and dry age them for at least three weeks. Both of these contenders weigh in at about 16 ounces. The differences of marbling in these two steaks are very obvious. The prime looks beautiful with its little streams and creeks of beef love (fat). The prime cut is also a tad thicker in girth and was a little firmer to the touch possibly because of the dry ageing. The only seasoning was of salt & pepper. They both were cooked over a very hot mesquite charcoal fire until they were medium rare. (125 degrees internal temperature) The prime took a couple minutes longer because of its thickness. They both were rested for 10 minutes before serving. The envelope please? This may come as a surprise but they both were equally flavorful with beefy flavor. The prime had a slight buttery mouth feel and possibly was minuscule more tender. Was the prime a clear knock-out punch winner? Not really,they both were fantastic steaks with beef flavor that we crave. Prime beef is expensive and difficult to find but that will not sway the judges. The Prime New York steak will be declared the winner by a TKO. The Prime is slightly superior with its tenderness and lusciousness. I do not think we can call the Choice steak a loser by any means. It will be a winner at any dinner we serve. Thanks for the taste test report. Big Dude, This was a taste test that we enjoyed a lot. I love a good New York Steak and Rib-eye and filet and sirloin and Porterhouse. I want to see the replay! I just bought a NY on sale for $9.99 a pound at Harvest Market. Looks more like your prime guy. Let you know the results. Greg, I am looking forward to your report. We may have to visit the Harvest Market. Three Dogs BBQ, That is a great idea except true Japanese Waygu Kobe beef has a different grading system. I can dream. Good test idea - wondered about the same thing. Lately I've been digging Flat Iron steaks. The price of beef has been crazy for a while yet flat irons are still reasonable and they have crazy beef flavor. I was surprised, because that choice looked a little sparse on the marbling, even for choice. That's great to know.